An illustration of NASA's Deep Space Gateway, a space station in lunar orbit. LAS CRUCES, N.M. — What role will NASA play in getting humans to Mars, and when will the agency depend on participation from commercial companies? A top NASA official discussed the agency's plans this week. Here at the International Symposium for Personal and Commercial Spaceflight (ISPCS) Wednesday (Oct. 11), William Gerstenmaier, associate administrator of NASA's Human Exploration and Operations Directorate, discussed how the agency is thinking about future collaborations with commercial companies. 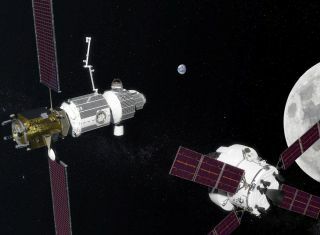 In its path to eventually send humans to Mars, NASA has laid out a multiphase plan that includes the work being done on the International Space Station (phase 0) and the construction of the Deep Space Gateway (DSG) around the moon (phase 1) in the early 2020s. The DSG will assist in the construction of Mars-bound vehicles and habitats, and serve as a launching point for astronauts bound for the Red Planet. Gerstenmaier emphasized that NASA cannot afford to carry out its entire humans-to-Mars plan on its own, but he added that NASA could serve two primary functions. The first would be to set standards for spaceflight technology and safety. As an example of standards in technology, he brought up existing international docking standards that enable different vehicles to dock at the International Space Station. Those standards, he noted, still make it possible for companies to innovate in the actual vehicle design. "We need to do that same thing in the life support area," Gerstenmaier said. That might include, for example, "the common pressure inside the capsules or in the modules that are in space. We need to understand the basic atmospheric constituents [that everyone should use]. We need to understand the basic data protocols [for measuring pressure and atmospheric content]. "[We could] set those standards … and anyone that builds hardware, and they build to those standards … they can be part of our system," he said. NASA is already working with two commercial companies — SpaceX and Boeing — to build vehicles that will carry humans to and from the International Space Station. Those vehicles must meet NASA's safety standards, as well as various other mission standards, Gerstenmaier said, but the companies are in control of the design and how they use the vehicles outside the NASA contract. "We let the companies design, build and own their systems," he said. "They can then market them; they can find creative uses. But NASA is there to make sure the basic safety, mission and success requirements are set in the right way." An artist's impression of astronauts on the surface of Mars. Boeing and other commercial companies are working with NASA to be involved in the agency's pursuit of human missions to the Red Planet. While NASA wants to encourage commercial participation in its human mission to Mars, the agency should design the basic architecture for the mission, so that no single company has a monopoly on any critical piece, Gerstenmaier said. "It's more important that [certain things] be owned by the government, and then they are available to the wider industry and not held by one company," he said. "Things like going to cislunar space [should really be] driven by NASA's needs, and then when we get down to … a service or a capability, then those can be done by the companies. "NASA can also help by providing substantial early demand and maybe being an anchor customer," he added. "But at some point, we need to get out of that mode and see if there's a market that can be generated."